Book Launch will be held at Urban Yarns on Thursday November 19th at 7pm: 4421 West 10th Ave. Vancouver, BC. Space is limited, so please call ahead at 604-228-1122 to reserve your spot. This 64 page, full – colour instructional knitting book appeals to all knitters; from “know nothing” beginners to those who want sophisticated hip designs. A Simple-to-use Guide to Creating Hip Knits provides both written and illustrated step-by-step instructions. The book goes beyond the basics; from “good to know” information to “must know” information. There are four original knitting patterns at the end of the book. Projects include: “gain confidence, skill progressive” scarf, unisex slouch hat, Mr. Ugly Doll, and tube top + shrug = sweater pattern. 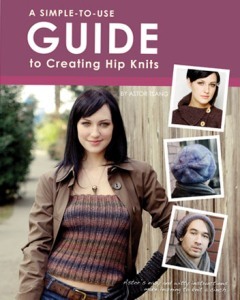 Introduction to Knitting: A Simple-to-use Guide to Creating Hip Knits is available at Urban Yarns for $19.95. Astor has been teaching beginners how to knit for almost a decade. With the experience of teaching hundreds of beginners – as in “know nothing” to “my grandmother gave up on me” beginners – she developed a nothing is obvious philosophy. Both in class and her designs, Astor is well known for her knitting humour. Her unconventional style of teaching has made her a popular knitting teacher in Vancouver. For more information about the book launch for Introduction to Knitting – A Simple-to-use Guide to Creating Hip Knits, please call Urban Yarns at 604-228-1122. This entry was posted on Thursday, November 12th, 2009 at 6:35 pm	and is filed under Uncategorized. You can follow any responses to this entry through the RSS 2.0 feed. Both comments and pings are currently closed.